Nataliya supports the volunteers who help us make this service possible, welcomes and onboards new volunteers, and sustains the operational side by optimizing delivery routes, processes, and communication to make each week a success. Where are you from? How long have you lived in Colorado? I was born in Ukraine. I have called Colorado my home for the last five years. What brought you to Project Angel Heart? I learned about the work of Project Angel Heart at a bag decorating party. As I was filling the brown canvas, I was also learning about the need for tailored meals specific to the medical needs of people in our community, the area of service and the uniqueness of the type of service Project Angel Heart provides. What’s your favorite thing to do in or around Colorado Springs? I love exploring brunch places! If the world were ending tomorrow, what would you eat for your last meal? Borsch, the beet soup, of course– the traditional Ukrainian fare. What’s your favorite thing about working at Project Angel Heart? The amazing volunteers make this service possible. It is wonderful to see how the opportunities to volunteer at Project Angel Heart include anyone– from a child to an adult, at any level of time availability– whether to help drive the meals to the door, decorate the bags, or help at the office or the kitchen. 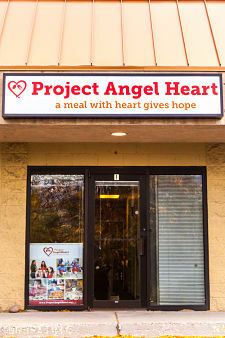 What are you excited about for the future of Project Angel Heart in Colorado Springs? I am excited for all the seeds that are being planted in the hearts of people through bag decorating, meal deliveries, participation in events, and all other volunteering they offer—whether it is time or resources—to sprout into a great presence of support in Colorado Springs. I hope this outreach connects the resources with more people that need it in our communities. 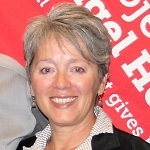 As the Colorado Springs Regional Manager, I have the distinct honor of propelling our mission forward in the Colorado Springs area. Delivering life-supporting meals to approximately 270 people here takes mobilizing and equipping a hearty community of caring, reliable, and capable volunteers to journey 160 square miles every Saturday. My role in promoting our mission also means both helping to grow our community’s understanding of how available and ‘right’ nutrition significantly enhances health and well-being, as well as connecting people and organizations with meaningful ways to support folks–our neighbors–who benefit measurably through our mission and meals. I’m one of many who get to answer this question with: I’m a brat. My father was a career Air Force officer, and I had the fortunate opportunity to experience home as many places and people. While I jump at the chance to explore and travel, I also love that Colorado has been my home base for the past 35 years. A friend connected me with the opportunity to engage, and I was – and still am – attracted to the mission combined with the quality, capacity, and dedication of the array of people who make up all that is Project Angel Heart. It’s a terrific recipe, so to speak…. I marvel every single day at the beauty that is my back yard, and enjoy cycling and hiking out in it as often as I can. I also enjoy building and being in community, especially with co-leading and singing with an incredible group of women who share song with people at life’s thresholds, primarily at end of life. Though it took me three visits to Japan before I would even consider putting a piece of raw fish into my mouth, I’m now hooked and sushi is my go-to. I’m pretty inspired by the act of many joining in shared purpose with what is meaningful. Our work with people and in the area of food, nutrition, and health draws together some pretty awesome folks from across the spectrum to create a meaningful and measurable contribution. I like being part of all of this. As a society, we seem finally to be remembering the value of and re-learning to trust thoughtful nutrition as a key contributor to our vitality. Buoyed more than ever by consistent affirmation both through countless client testimonials and sound data, I’m looking forward to how we can support people and our communities to be living even more vibrantly through good food. This entry was posted in Colorado Springs, Volunteer and tagged meet the team, staff, staff profiles by Hannah Koschnitzke. Bookmark the permalink.